In interviews with BBC and Sky News, WikiLeaks founder explains how Google's behavior, though legal, is like that of surveillance agencies. "Google's business model is to spy," Assange told the BBC. "It makes more than 80 percent of its money collecting information about people, pooling it together, storing it, indexing it, building profiles of people to predict their interests and behaviors and then selling those profiles principally to advertisers, but also to others. "The result is, in terms of how it works, its actual practice, is almost identical to the National Security Agency or GCHQ," he said. 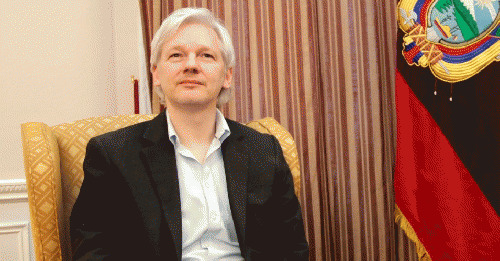 In similar comments to Sky News, Assange said, "Google has become, in its behavior, a privatized version of the NSA. It's not that it's doing things that are illegal. It's not," he said, explaining its profile-building practices. "That is the same procedure that the National Security Agency or GCHQ goes through, and that's why the National Security Agency has then latched on top of what Google is collecting." Google has been involved "since at least 2002 working with the NSA; in terms of contracts they are formally listed as part of the defense industrial base. Since 2009 they've been engaged in the PRISM system where information collected by Google, nearly all information collected by Google, is available to the National Security Agency." "Google has been reasonably successful in the U.S. debate shifting its collaboration with the NSA towards the NSA itself," he said. Asked by Sky News, "What next?" he explained how high the stakes are in determining the future rules of the Internet. "The Internet, because it is merged with society, is now the future destiny of human society. Unlike our nation states, the Internet is a global phenomenon, so the laws and standards that we erect on the Internet we're erecting for the whole world at once. So if we get them wrong, it will affect everywhere at once, so those are the stakes."